Toes to bar can be a tricky movement to RX. They aren’t necessarily a skill that you may have learned when you were younger, since they’re a very CrossFit®-specific movement. And I use the word tricky, because they really aren’t always as easy as some athletes can make them look. So let’s take a few minutes to breakdown the toes to bar movement, into a progression format. Whether you have no idea where to even start with toes to bar, are having issues stringing them together, or working on being able to do more in a row, then you’re in the right place. The goal when learning proper toes to bar technique is first and foremost, being able to get those toes up to the bar. From there, your aim should be to string big sets together… therefore finishing workouts more efficiently. Yet as you may have already learned, it’s not quite as simple as just hoping up on the bar and getting your toes to touch. Doing whatever it takes to get their feet to touch the bar, usually resulting in a ton of extra swinging. In order to avoid the flailing and swinging around (which is a huge waste of energy, by the way), let’s break down a toes to bar progression. Let’s start very simple. Adjust your hands on the pull-up bar to be about shoulder width, while keeping both your core and legs tight. Once you are hanging, make sure that your shoulders are activated. Swing back and forth, changing from hollow position, to arch position. If moving back and forth from the hollow and arch positions is difficult for you, try dropping from the bar and trying this drill on the floor to get more comfortable with the two movements, and how your body adjusts between them. We are now going to build off of beat swings, yet start to build the elevation while still in the hollow body position. During this step, make sure you’re mindful of activating your lats. This is going to help with getting a higher lever. Kipping levers should not be using your legs. If you do find yourself using your legs, you are probably forcing a kip (not good). Think back to the basics of tight legs and core, so that while levering back, your feet move a bit in front of the bar, still together. The lever portion of toes to bar is vital, since it’s what ensures that you are able to get your torso far enough back from the bar, creating the space that you need to then bring your legs and feet up to touch the bar. No lever, and odds are your kip will start to look like you’re a monkey! Feel read to move on from kipping levers? Great, let’s start focusing on getting your knees up. Don’t forget about the importance of lat and shoulder activation, and while levering back, lift up your knees towards your chest. This movements of knees to chest (not touching your chest, just towards it) should be fluid, so that you can continue with the movement several times in a row. Important: Knee raises does not mean knees to elbows. Your knees really only need to be coming up to around your belly button in order to get the feeling for this step in the toes to bar progression. As long as you are able to start lifting your legs (knees) to that point while maintaining your kip and control, then you’ve achieved the goal of step 3. Now it’s time to actually get those knees all the up to your chest, and past your belly button. Fluidity is going to be key once again. While moving into this step of the progression, think about aiming for your elbows, while kipping harder than in the previous steps. Kipping with more force will make sure that are able to get your torso out of the way as you past under the bar, so that your knees can then touch your chest. Remember: Active both your shoulders and lats to achieve a strong kip. The timing of your kip will also change at this point, as bringing your knees up higher is going to take longer. Focus on staying balanced and controlled: just because your kip is changing, doesn’t mean you should be adding any extra movement to the movement such as swings between reps, etc. Sidenote: This is sometimes a point of contention, and you may be coached differently in your gym… but I personally have no issue with bending your knees during this step. In the long run, it’s going to help you cycle through the movement easier. It’s time to Rx TTB! Keeping everything in mind from the previous four steps, the only thing that is going to change is finally getting your toes up to that bar. Try not to overthink it; a good cue to keep in mind is ‘flicking’ your feet up towards the bar. Don’t lose your strong, engaged kip, and from knees to chest, flick up both of your feet (at the same time) to touch the bar. Something worth mentioning about this final step is that once again, the timing of your kip will change as you add more movement. Keep this in mind, and if necessary tweak your timing. This is going to be achieved through simply practicing the movement. Let’s take a quick look at the different cues we’ve mentioned for learning TTB. This cue is absolutely crucial when entering the arch position of toes to bar (explained in step one). As your body moves back under the pull-up bar to begin another rep, think about pulling your head and torso through (almost as if your arms are creating a window). Simultaneously, your feet should pushed back behind your body. This will help to build for a strong arch, setting yourself up beautifully for the next rep. If you’re working on toes to bar and find yourself with extra time before or after your next WOD, try working through the toes to bar progression laid out above. It might help you find what that missing piece of the movement is, and before you know it, you might just be stringing together toes to bar with ease! Looking for even more toes to bar help? 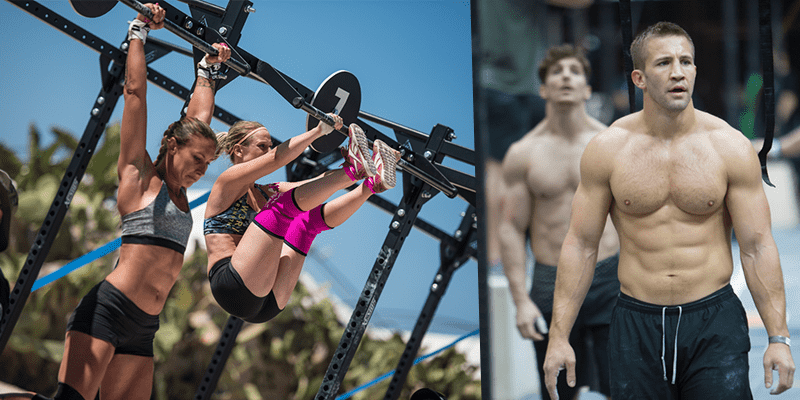 Check out our free toes to bar guide here!